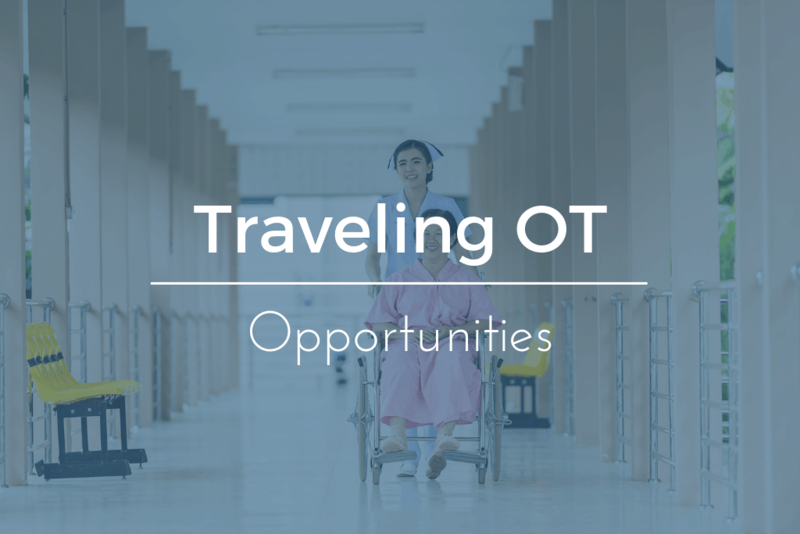 There are a number of traveling OT opportunities for travel occupational therapy assistants to pursue. It seems that these traveling OT positions aren’t very well known and there are many questions about them. Specifically, OTA want to know what is different about a traveling OTA? So, today we are going to dive in and share 10 facts about travel occupational therapy assistants to answer all these questions. Where do Traveling OTA Work? The requirements for becoming a travel occupational therapist are exactly the same as it is for a usual OT. Their responsibilities are also exactly the same. A certified occupational therapy assistant (COTA) assists a licensed occupational therapist (OTR). Together they treat patients with a variety of illnesses, injuries, and disabilities who struggle performing daily living and work activities known as ADLs or Activities of Daily Living. The above job description is true for both traditional COTA and Traveling OTA working in multiple settings. The type of medical settings that a traveling OTA will find themselves in are similar to any other as they will work in clinics, hospitals, rehabilitation centers, community health programs, and skilled nursing facilities as well as providing care for those staying at home. We wrote this post sharing a complete list of places OTA work that will give you more ideas for settings where traveling OTA may be found working. This type of OTA has plenty of job opportunities in that they don’t need to worry about there being a shortage. Healthcare facilities always have positions that are available in one part of the country or another because of a shortage of staff, people that are on leave, and absences. A traveling OTA will typically work on a contract basis and after their assignment is finished they will then go to the next project and new destination. Because the jobs are on short-term contracts it won’t be necessary to stay for long periods of time. If however, an OTA decides to take a permanent job then they will be obliged to stay in that one setting for at least one to two years before they could relocate to a new work setting. The common practice is to give an occupational therapist assistant who is new some very difficult tasks and a lot of supervisory work and sometimes even unrealistic standards are set and this makes many feel as though they’re being taken advantage of. A traveling OTA, on the other hand, has a stronger position to refuse unrealistic tasks if a hospital tries to assign those to them. It is easier to simply leave and work in a different location if necessary. The average company will provide a mentor for the therapist who is traveling to help them through the process of every stage when they’re starting out. These mentors will help to locate a new place, they will help with therapy, and even provide ethics lessons and other services to improve your career. When you get started in this profession you’ll be able to decide whether or not you want to be completely independent or if you want to work with a placement service. If you do decide to go with a placement organization then you’ll want to make sure you’re familiar with their policies and terms and this includes any health benefits they offer. You should also know their termination policy, how they allow you to go on leave and so on. According to some online sources the average traveling OTA can earn on average $68,308 and up to $121,000 a year (According to ZipRecruiter) which is considerably more than what an occupational therapist assistant who is working at one location full-time would make. Below we share more OTA salary data from our salary database on the top paying cities, but on average, an OTA working in one location full-time would earn $57,620 annually. The allowances that are given to a traveling OTA includes gratuity as well as a higher salary. If you use a placement company they will often pay for housing, provide mileage reimbursement, a non-taxable living stipend, referral bonuses, a bonus for completing your assignment, and a 401K. In addition to these benefits, you also have the chance to travel the country and see a number of new places. According to the Bureau of Labor Statistics (BLS), the national mean wage for Occupational Therapy Assistants is $60,410 annually and $29.04 hourly. This is a very competitive salary to earn which only requires an associate degree. Similar healthcare careers which require associate degrees pay well but many don’t pay this well. Although physical therapy assistants earn $57,620 annually, this is about the only other 2 year healthcare degree that earns close to an OTA. We’ve compiled OTA salary data for every major city in the U.S. and we took that data to create today’s infographic. In the infographic, you can see the top 8 cities that pay OTAs the most in terms of hourly and annual mean wages. Wow, the top 8 cities pay an average salary for Occupational Therapy Assistants that is between $72,600 and $105,000 annually. Although living in Las Vegas isn’t the lifestyle for everyone, it is important to note that you could find a traveling OTA job there that only required you to live their part time. Many parts of Texas pay OTAs very well so if you like horses and beautiful sunsets then perhaps you should look into some of these Texas cities. As you can see, Texas is home to many of the highest paying cities for occupational therapy assistants. Should I Move for Higher Compensation? This is a common question that many people have once they start researching what other occupational therapist assistants in their field are earning in other locations. The short answer is, ‘no’. The cost of living may be higher in other regions. This could completely offset your increase in comp or even leave you with less money than you currently have after your expenses are paid. Your quality of life may be lower in other regions. Depending on your current situation and where you are considering moving too, make sure you take into consideration your quality of life. Things like the length of your commute, the people you work with, the safety and amenities of your neighborhood etc. There will be an increase in job responsibilities. Often times a higher paying position comes with some additional responsibility. This is great if you are qualified and prepared for the added workload, however, some may find themselves overwhelmed with what they signed up for. Just make sure that if you are considering a move for higher compensations that you take everything into account when making the decision. Where you will live, what things will cost you, what your day to day will be like and specifically what are all of the major changes. One of the best ways to make these decisions is to make a “T-chart” with Pros and Cons. Basically, you want to see a list of all the benefits and detriments to making the move. Once you have a list with all of the information, side by side right in front of you, it is much easier to weigh your options and make a decision. Alright, so now you know everything you need to know about traveling OTA and the top 8 cities that pay occupational therapy assistants the most. If these locations aren’t interesting to you, then don’t worry. You can work as a travel occupational therapy assistant and find the location that suits you best before settling down. Stay tuned for our next infographic that will share some of the top paying fields for OTAs to work in such as pediatric, geriatric, and home healthcare. Click those links to learn about OTAs working in many places to get some ideas. Perhaps you can stay in your current location but find another position for OTAs to try your skills in and receive better compensation.